St. Louis Property Management, St. Louis Property Managers, St. Louis, MO Property Management Companies. It would take years of costly mistakes to become an expert in all these areas. But the decision to hire Eaton Properties as your management company will give you access to these experts and more. Eaton Properties is one of the largest and most respected property management companies in the St. Louis / St. Charles area. We take pride in our attention to detail powered by our state of the art software system. Staying on the cutting edge of technology allows us to give you better service at a lower cost. What you will notice most about Eaton Properties is the friendly personal service and clear communication we provide to both owners and tenants. Your decision to invest in real estate is so you can have a passive source of income, not so you can have another full time job. Give us a call to find out the multitude of services Eaton Properties can offer you. We will help provide insight into what your property is worth as a rental based on neighborhood, condition, surrounding properties, market saturation and what comparable properties are bringing. We can determine if it will qualify to rent under a subsidy program and what repairs might be needed, if any, to pass occupancy inspections. How quickly a property rents may have a great deal to do with how it shows even when it’s priced right. Why should the prospective tenant choose your property over another similar home down the street for the same price? We will help you look at the overall condition of your home, (old, dark and tired or fresh and inviting) and will help suggest cost effective changes that can get you a tenant on the first showing. Our state of the art software system stores information on your property and as soon as it is available to be rented, pushes it out to the most searched internet marketplaces. Our website drives tenants to us and allows them to see your property listing without leaving the comfort of their home. We provide constant print media advertising, in publications that get results. We are one of the most well known property management companies in the area. Our 24 hour tenant call line allows us to capture tenant information and set up showings at the tenant's convenience. Even with all of these high tech outlets we pride ourselves most in the number of referrals we receive from satisfied tenants. A good reputation is the best advertising. If a tenant can’t see a home they can’t rent it. We have a team of leasing agents who work days, evenings, on weekends and holidays; whenever a tenant wants to look at a home, someone will be available to show it. We work within the tenant’s schedule, to get the most showings possible. Our average 98% occupancy rate speaks for itself. Carefully screening tenants can greatly reduce the chances that a tenant will stop paying rent, will do damage to the unit, or will become a neighborhood nuisance. Past actions can often predict future actions. We carefully screen tenants looking at credit scores, late payment histories, past evictions or disputes between landlord and tenant or other civil actions taken. We check for any criminal activity, drug or domestic violence, prior arrests, etc. We verify work history and income to make sure the rent amount falls into reasonable parameters. Taking these extra steps can increase the chances of getting a tenant that will stay long term and will take care of the unit. Having the proper wording on a lease can make the difference between a lease that can be enforced and a lease that is a worthless piece of paper. Being a fully licensed real estate company our leases have been reviewed by our attorneys and have been audited by the Missouri Real Estate Commission for compliance with all Missouri statutes and regulations. We carefully go over each item in our lease with tenants to make sure that they fully understand everything they are signing. We do not want to “slip something by them” by filling the lease with all sorts of unreadable legalese. We have also made sure that if legal action against a tenant is necessary, that our lease will stand up in court. Each municipality has its own set of rules for occupancy. We know the codes and what occupancy inspections and permits are necessary. We make sure that each move-in is done according to that municipalities rules, insuring that you do not have a delay in your move-in or a costly fine for non-compliance. Our office handles all rent collection. We receive the rent and credit it to the proper tenant and owner account. We fill out all paperwork for subsidized rent and keep track of changes when they occur. We charge the tenant's account for any utilities or damage charges when necessary. We have full time staff who track all late payments, makes contact with the tenant and aggressively pursue the collection of the rent. In the occasional event that a tenant does not pay their rent despite all of our collection efforts, we act as your agent working with an attorney to file the proper paperwork to begin an eviction. We appear in court on your behalf and move forward on the process quickly and efficiently. We believe that the collection of rent is one of the most important functions of managing your property. Timely and competent maintenance is the key to protecting your investment. Our goal is to provide you with high quality service at a reasonable price using only qualified contractors. Routine repair and maintenance of the property is an ongoing task. Our 24 hour answering service will take the tenant's repair request, forward it to our office and a contractor will be chosen to perform the repair based on urgency and availability. Emergency calls will be directed to one of our staff immediately day or night. Any major jobs or rent ready repairs, will require an evaluation of the property , and the property manager and owner will work together to determine what repairs or improvements should be made at that time, and what repairs or improvements should wait. We insure the quality of the work performed by making spot checks and follow up inspections. You are further protected because each job is fully documented in writing and supported with receipts. We make all payments to contractors and pay all utility bills and other relevant property service bills including management fees for you. Payments are deducted from your owner account as they are made. Keeping a reserve in your account at all times insures that repairs are not delayed waiting for money to arrive. Reserves are replenished monthly from rents received. We also send out 1099’s to vendors at the end of the year. In addition to monthly statements, we can also provide a complete year-to-date account summary. This shows you each accounting transaction posted to your property during the year, such as total rents received, total mortgage payments made, total maintenance expenses, etc. This statement is specifically designed to simplify the year-end tax preparation job for you or your accountant. We keep you informed. If anything out of the ordinary is going on with your property, your property manager will let you know so you will not be caught off guard and so we can decide together how to proceed. We want to be your partner in management based on mutual respect. We want to get to know you and your individual investment goals so that we can keep you constantly moving toward that goal. INVESTING IN INDUSTRY LEADING TECHNOLOGY: We have invested in a state of the art web-based property management and accounting system. This enables our experienced team of professionals to manage your properties with the highest level of service. Our software not only provides great benefits to our office but we are also able to share many of these benefits with you. FASTER RESPONSE TIMES: We can respond more quickly and offer excellent service to both owners and residents. At any time and from anywhere we are able to securely access data about all properties. Sensitive records are safely stored in a state-of-art data center which is automatically and routinely backed up. REDUCE PAPER CLUTTER: We can save time and paper by using email to send monthly owner statements. The statements are organized in a concise and easy to read format that details the performance of your property for the previous month. We can also post these monthly statements on a secure Owners Portal. FASTER RESPONSE TIMES: We can process and respond to maintenance requests more quickly, we can resolve issues by accessing vendor information and using electronic work orders for more efficient communication. Because our system is web based we can have all the information we need at our fingertips, even on evenings and weekends. All records are instantly updated and stored for future access. FASTER OWNER PAYMENTS: Deposits can go directly into your bank account using ACH (electronic payments). INTERNET MARKETING: We can market your properties in more locations across the Internet, filling vacancies much faster. Our integrated system lets us professionally advertise your properties on our company website, and a multitude of other Internet locations with a touch of a button. ONLINE INQUIRIES: Prospective residents can contact us online with the click of a button. Online property inquiries are integrated with all vacancy postings. This allows us to capture potential tenant information and follow up with a phone call and showing, saving lots of time and ultimately filling vacancies more quickly. ELECTRONIC PAYMENTS: Residents can avoid sending rent checks by paying their rent electronically. Rent payments are received more quickly and on a scheduled basis each month. This is a great value-added service for residents. Buying or selling investment real estate is a very different animal. Many real estate companies are not familiar with this type of transaction, but it is our specialty. If you are investing for the first time, or if you are a seasoned investor let our specialists work their magic to find you a great property that will cash flow for you. The city is defined by music and the performing arts, especially its association with blues, jazz, and ragtime. St. Louis is home to the St. Louis Symphony, the second-oldest symphony orchestra in the United States, which has toured nationally. 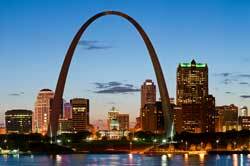 The Gateway Arch marks downtown St. Louis and a historic center that includes the Federal courthouse where the Dred Scott case was first argued, a newly renovated and expanded public library, major churches and businesses, and retail. An increasing downtown residential population has taken to adapted office buildings and other historic structures. In nearby University City is the Delmar Loop, ranked by the American Planning Association as a "great American street" for its variety of shops and restaurants, and the Tivoli Theater, all within walking distance. The city operates more than 100 parks, with amenities that include sports facilities, playgrounds, concert areas, picnic areas, and lakes, making St. Louis the perfect place to call home.